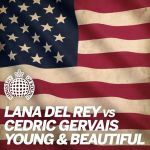 Another good Lana Del Rey remix by Cedric Gervais. The "Summertime Sadness" remix is better however. 3.75*. This is the epitome of pointless. I really liked the "Summertime Sadness" remix and thought it had a lot of personality and character and was better than the original (it also helped to help me appreciate the original more). <br><br>However that is not the case with this. It sounds like the beat to the "Summertime Sadness" remix and two other different beats were just added to the original track without caring if it sounded good. It ends up being messy and really quite poor. Inferior to the original.<br><br>Hopefully if Cedric Gervais does anymore remixes they will be more in the vein of the "Summertime Sadness" remix and not this one. I don't understand why these even exist, nor why people would want to buy them but I hope this is the end. Why why why why???? It's not terrible but it adds absolutely nothing. See my review for the original 'Young & Beautiful'. Un remix plus intéressant que celui de "Summertime Sadness". I dislike this but don't hate it. It is just completely uninteresting. There's nothing interesting, prominent or exciting about Cedric Gervais and I hope these go away. Wie kann man jedes Fünkchen Atmosphäre aus einer wunderbar stimmungsvollen Nummer herausquetschen?<br><br>Genau so. This remix sounds a lot more forced to actually be a remix than Summertime Sadness. I prefer the aforementioned song, this isn't great but I somehow liked it before, sending it up to a 2.5*. Jedenfalls besser als der "Summertime Sadness" Remix. Australian radio for the most part was playing the Kaskade remix of this song, but everybody listening assumed it was the Cedric remix instead and downloaded it. But the Cedric remix is not even good. Check out the Kaskade one if u get a chance. It's far better!